Want to make a career out of your passion for art, but afraid of being a starving artist once you graduate? Check out design college rankings by graduate salary. If you have a passion for the arts but don’t want to live as a starving artist for the rest of your life, make a smart decision about where you earn your bachelor’s degree in art. You don’t have to go to an art school to embark on a successful career in art. Art school has a bad reputation for leaving heavily indebted grads with low-paying jobs, but some art and design school alumni fare pretty well in terms of post-grad salaries. 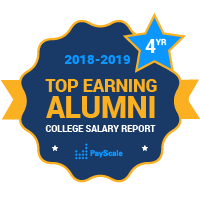 There are more than 100 colleges and universities included in PayScale’s list of highest-earning colleges for art majors, and many of the schools on this list prove that art majors can earn high salaries – you just have to be smart about which school you choose and what you study.